This Brut Antique Premier Cru Champagne is composed of 40% Pinot meunier variety, 35% of Pinot Noir, and 25% of Chardonnay. A great alchemy from the cellar master, and at the same time, a signature from this very old house from the Champagne region, where time and experience meet art. The colour is an amber gold. The nose discloses aromas of flower, white fruit with a few notes of citruses. The taste offers a sensation of freshness, subtly vinous with touches of dried fruits and brioche bread. To be served between 6 and 8°C. Food pairings : sumptuous as an aperitif and also with white meats like Bresse chicken or filet mignon. The Cattier House is located in Chigny-les-Roses, an exceptional territory classified Premier Cru, in the heart of the Champagne region, between Reims and Epernay. 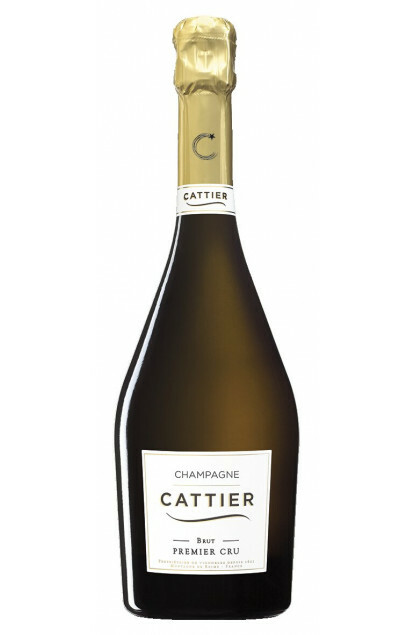 The Cattier family owns vineyards since 1763, but it wasn’t until 1918 that Champagne Cattier was created. In 1951, the Houses acquired the Clos du Moulin. The House’s vineyard spreads on more than 30 hectares in Premier Cru, on the well-known Montagne de Reims. The cellars are more than 30 metres underground, on three floors, and one of the region’s deepest. They display 3 architecture styles : roman, gothic and Renaissance. Excellent for optimum maturation. The House is still independent and family-owned, and the annual sales amount to 1 million bottles, of which 60% are exported in more than 70 countries.